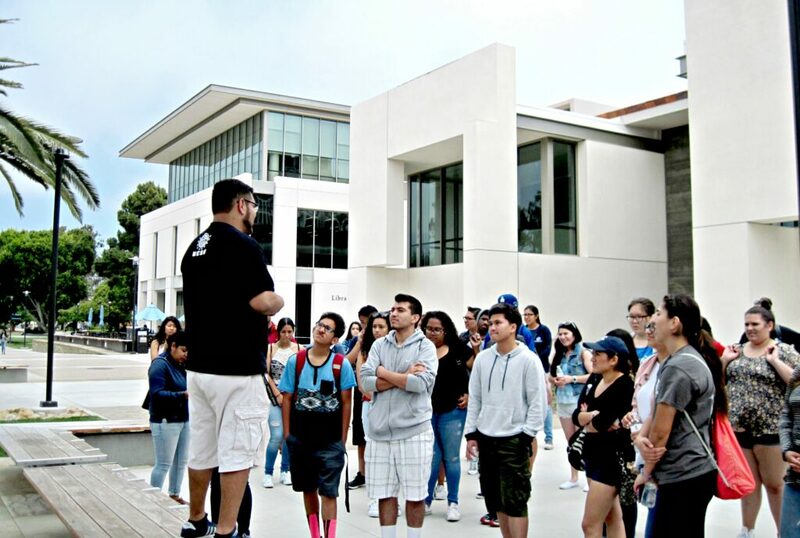 UC Santa Barbara student and guide Juan Pedroza welcomes Los Angeles harbor area teens to campus. At 9 a.m., the first group of teenagers boarded a yellow school bus at the Boys & Girls Clubs of the Los Angeles Harbor in San Pedro, close to the West Coast’s largest port. After two more stops to pick up others, it headed north on the crowded freeway to Santa Barbara, 125 miles up the coast – and to a glimpse of their possible futures. 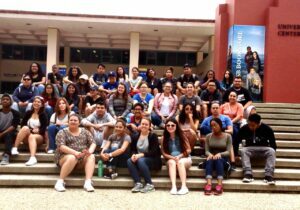 Thirty-six students, most from lower-income and immigrant families, then spent the day touring two campuses – UC Santa Barbara and Santa Barbara City College. Almost 12 hours later, the bus was back where it started, but many of the students were not – their eyes had been opened to expanded opportunities. Allison Mendoza, an incoming senior at Banning High School in Wilmington and the daughter of Mexican immigrants who never finished high school, said she was “mind blown” at UCSB to see the many academic departments, counseling centers offering walk-in hours and the surroundings of beach and mountains. She wants to study psychology there. Sebastian Molina, a 9th-grader at Harbor Teacher Preparation Academy, was impressed too, even with a few years to decide where he wants to attend college. He said he probably would apply to UCSB, among other schools. Trips like this one, he said, are opening his eyes to campuses other than schools closer to home, such as Cal State Long Beach and UCLA. 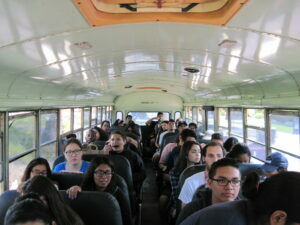 On board the bus, students head to Santa Barbara. For middle- and upper-income teens, college tours traditionally involve a family road trip, complete with hotel stays. But lower-income and immigrant families may lack the funds, time or experience to organize such college visits and feel intimidated by the prospect. 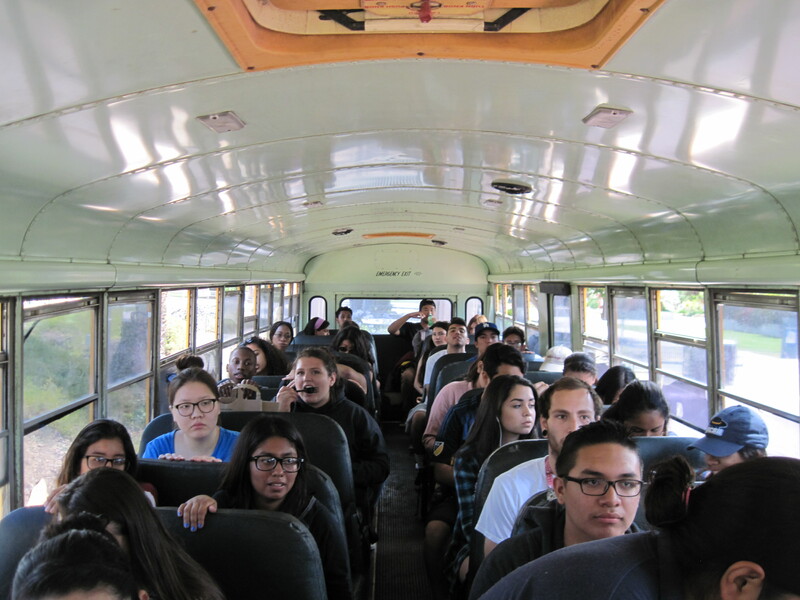 So, increasingly, nonprofit organizations, schools and college entrance programs are providing free or very low-cost bus tours of colleges – and cross-country flights in some cases. “It’s a game changer for a lot of students,” said Alison De Lucca, executive director of the Southern California College Access Network, a consortium of college readiness groups. Tours, she added, encourage low-income and first-generation students to see themselves as freshmen at schools they might never have considered previously. “It’s a game changer for a lot of students,” said Alison De Lucca, executive director of the Southern California College Access Network. 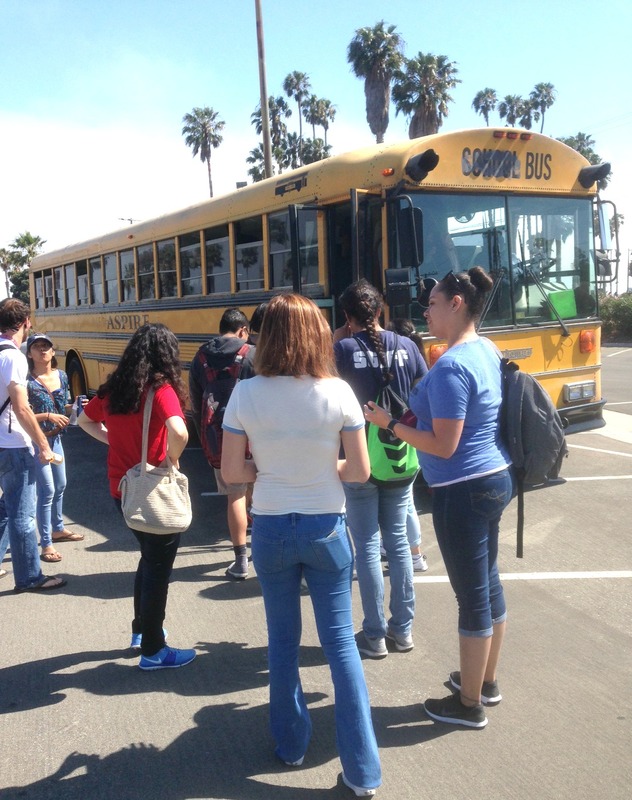 The Boys & Girls Clubs of the Los Angeles Harbor is sponsoring seven free bus tours around Southern California this summer, including visits to Riverside and San Diego, as part of its College Bound program, which also helps with test preparation and financial aid applications. Irene Rodriguez, another senior-to-be at Banning, joined the trip to Santa Barbara and plans to take others. Five program counselors were on board to oversee the teens. “I want to see different environments and all the different colleges we have in the state,” said Rodriguez, who wants to become an elementary school teacher. Since it would be too difficult for her widowed mother, a housekeeper with three younger children, to take her to campuses, the tours are her ticket “to visit as many schools as I can,” she said. Volunteer guide Juan Pedroza leads Los Angeles students around UC Santa Barbara. 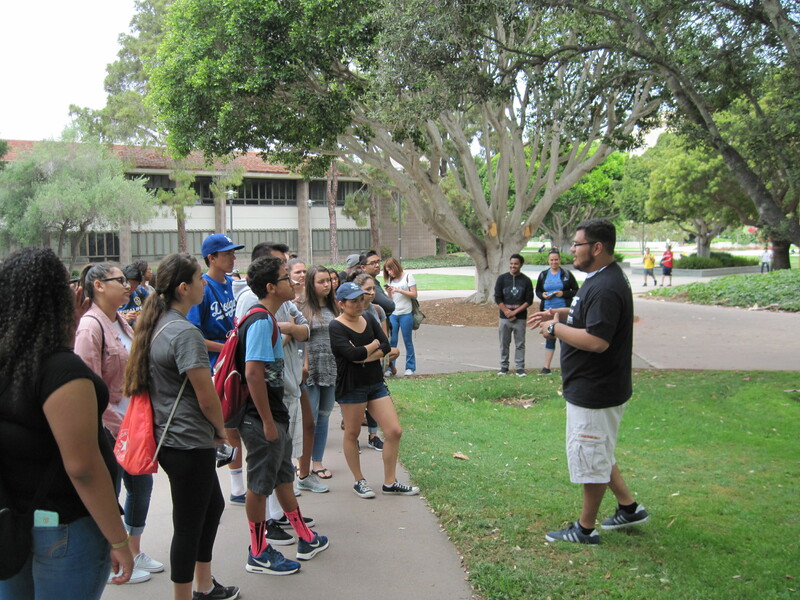 At UCSB, volunteer tour guide Juan Pedroza greeted the students. A third-year student from a Mexican-American family in East Los Angeles, Pedroza first came to UCSB on a bus trip for a college prep program at his high school and is now involved with Hermanos Unidos, a UC campus Latino group that emphasizes academic achievement. Pedroza told the Los Angeles teens that if he could succeed at college away from home, so could they. It is good for them to “get outside their own bubble,” he said. He led the students past classroom buildings, counseling centers, sports facilities, dining halls and the campus bell tower. They rode elevators to the eighth floor of the library, with its panoramic views of the campus and adjacent beach. 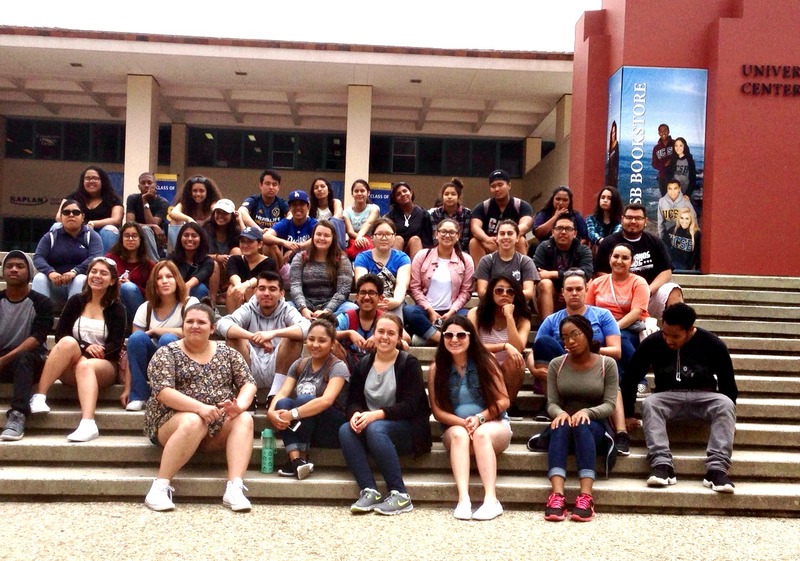 High school students from the harbor area of Los Angeles pause by the bookstore on their tour of UC Santa Barbara. Some students’ questions showed how little they knew about college life. One asked whether every floor of the library has the same books. Other students expressed surprise to learn that the same course could entail lectures by professors as well as smaller discussion groups led by teaching assistants. As the group walked by campus police cars, Pedroza mentioned the 2014 rampage in which a troubled man killed six students in nearby Isla Vista. Security has been beefed up since, he noted. Several students wondered about a possible everyday danger to pedestrians: the many bicycles on campus. But the bikes appealed to Violet Ruetmann, a senior at San Pedro High School – so much so that she said she probably would add Santa Barbara to her application list, although UC Berkeley remains on top. “I like to ride and I want to meet other people who like to ride,” she said. More important to her, however, were the strong academics, the proximity to the beach and the school’s medium size, with about 23,000 students. After touring Santa Barbara City College, the students board the bus for the long ride home. Karina Dorado, a Boys & Girls Club counselor on the trip and a 2012 UCLA graduate, recalled a similar ride she took in 2007, when still in high school. After the UCSB campus visit, the tour moved on to Santa Barbara City College, a hilly beachside school with a strong reputation for transfers to four-year universities. There, counselors led them around, with a snack stop in the book store. Compared with their urban high schools, several students said, the community college had much more greenery and open space. Heading back home, the noisy bus hit traffic. And the adult chaperones told the teens to call their parents and let them know about delays. By 7:30, they were back. Mendoza, about to start her final year at Banning High, said her parents would have a hard time taking off from work for college tours, but they yearn for her to finish college. Of course it’s a great thing to help low-income students learn about college and give them all possible encouragement, information and support. But elites honestly have no clue whatsoever how overwhelmingly challenging it is for a low-income student to do the same things middle-class kids do without a thought — make their way through college for four years without generating a full-time income, travel back and forth to college and deal with school breaks* (for those attending college not near their homes), simply live life around people raised in comfort and privilege. That’s not a reason not to encourage low-income students to reach for the stars, college-wise, but we middle-class people need a big dash of cold water regarding how challenging the logistics are. 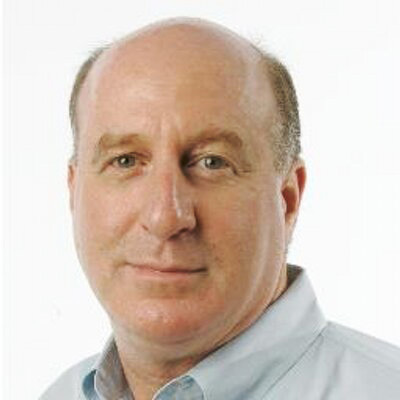 Meanwhile, we need to restore ample, effective career/vocational/technical programs IN high schools IN the curriculum for students of all social classes whose aptitude steers them in that direction, and we need to do quit the “everyone must go to college” BS that sends so many young people into the greedy grasp of scammy for-profit colleges and into crippling college debt. *I know, you’re wondering what I’m talking about. I mean the one-week fall break where the resourced students zip home and back, or elsewhere, in their cars or by air, and the students who can’t afford the trip home have to stay on campus and find their own food, with campus dining closed. Followed a few weeks later by the long Thanksgiving weekend, same thing, etc.